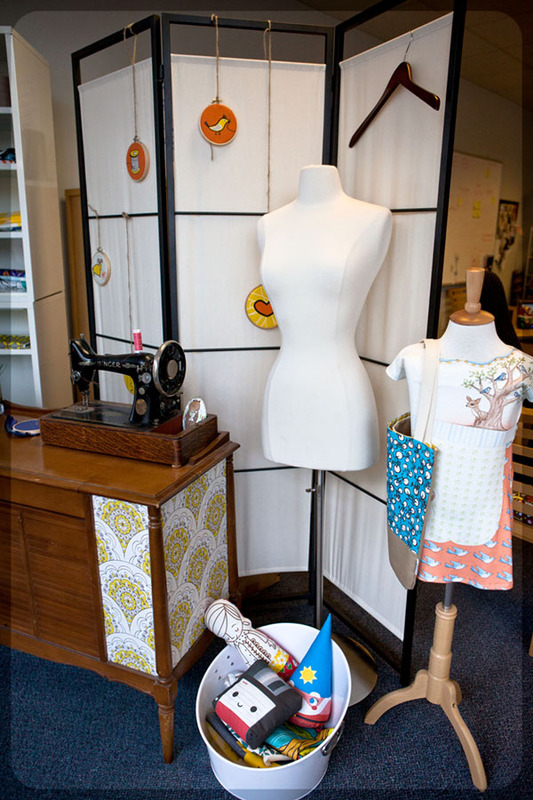 Spoonflower is a small company that prints fabric on demand from your very own designs, by the yard. Such an awesome idea. I discovered them online while doing a search for “print your own fabric.” I’d been trying unsuccessfully to print my own designs on fabric with my home printer. I managed to print on muslin taped to cardstock with masking tape but that nearly ruined my printer, the sheets were just 6″ x 8″ and the colors were washed out so I gave up. What I wanted was yardage so I was thrilled when I stumbled upon Spoonflower. The process is simple. 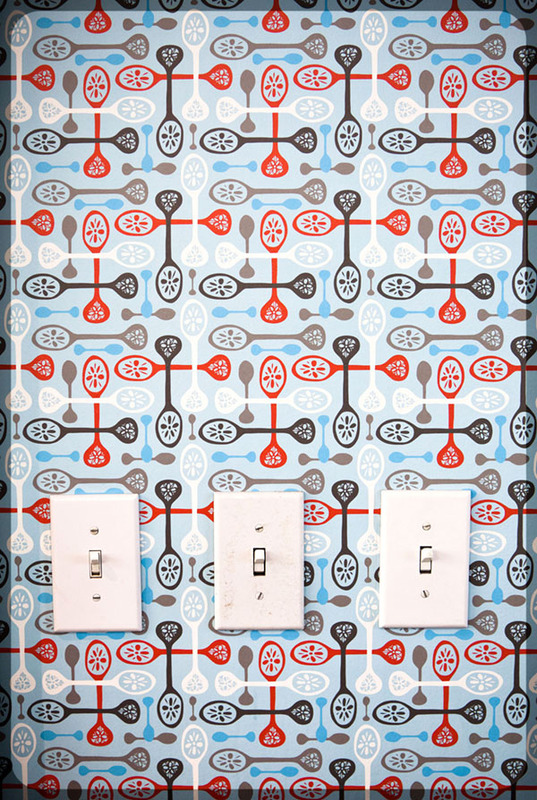 You set up an account and upload your own design file to Spoonflower. There are ten different beautiful fabrics from which to choose, from silk to organic cotton to upholstery weight linen blends. Spoonflower prints your design on the fabric of your choice and mails it to you. It’s that simple. If you don’t want to design your own fabric, you can purchase fabric from thousands of other designers. They also print Wallpaper and Wall Decals so you can paper your whole house with your own design if you want. I snapped some quick photos during the tour through the facility but would love to go back to get more. Seriously. I didn’t get a fraction of all the beautiful scenes. I’m sorry I didn’t take any photos looking up – even the ceiling was dangling with fabric delights. That place is filled with creative people and every part of the “factory” is a visual feast. 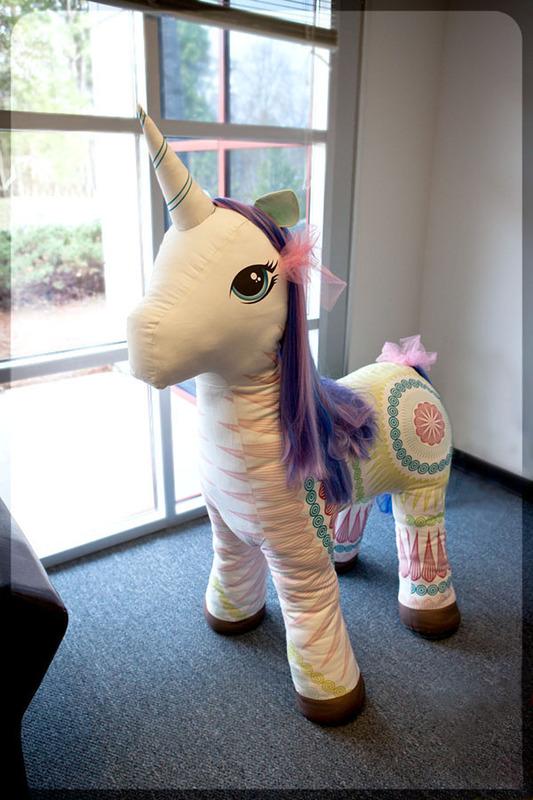 The first item I saw was this terrific Giant Stuffed Unicorn, made by some of the staff members of Spoonflower for a staff competition. You can read more about it here. 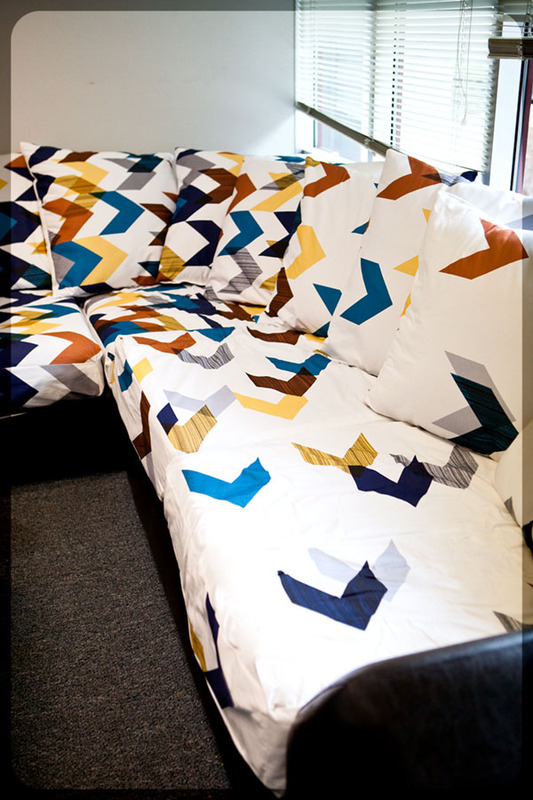 Another staff-created project is the terrific Chevron slipcover for their office sofa, which you can read about here. 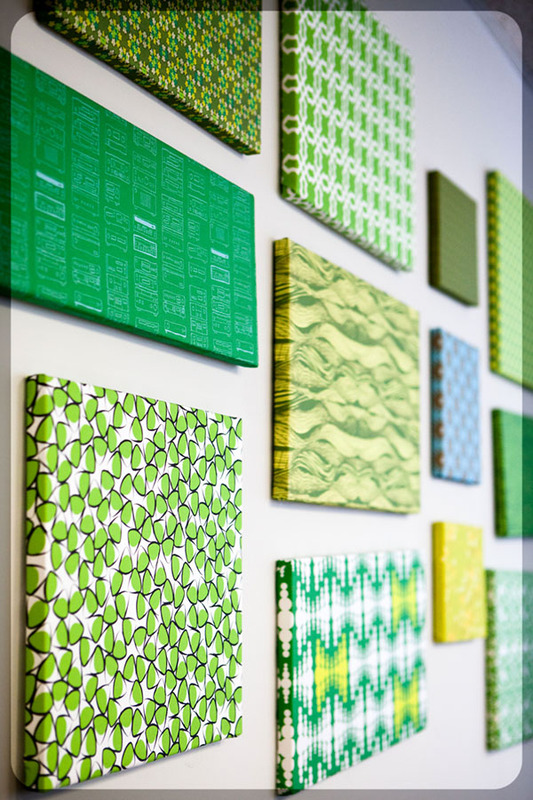 One area of the office featured projects using Spoonflower fabrics. 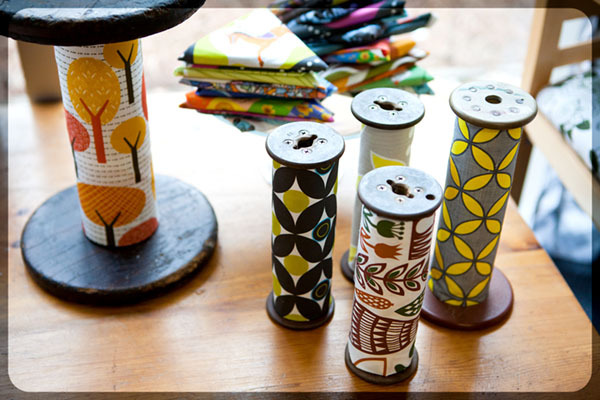 Old spools were wrapped with strips of fabric printed by Spoonflower. Another staff-created project was this reupholstered chair. What a terrific idea to update a piece of furniture. 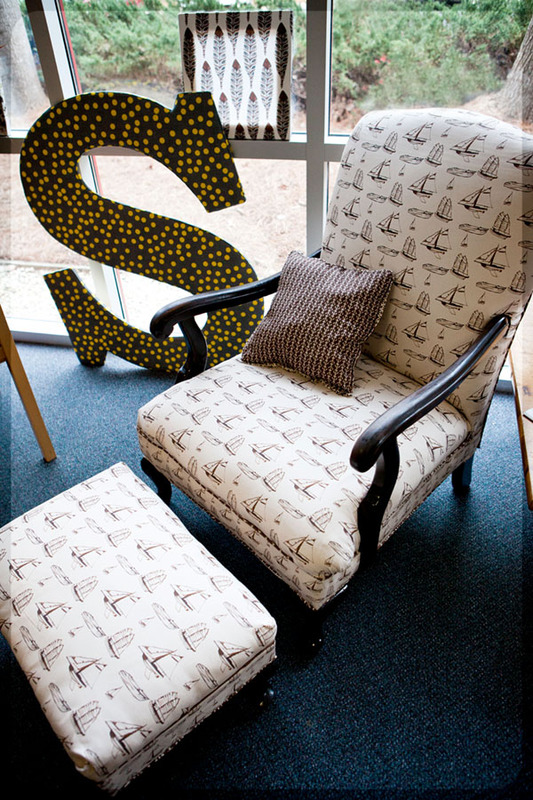 The pillow, the picture against the window, the giant “S” … all done with fabrics from Spoonflower designers. Reupholstered chair pads, each a different pattern and color. I would love to do something like this for our occasional chairs, perhaps using fabric featuring my own children’s drawings, or fabric designed from one of my mom’s floral paintings! 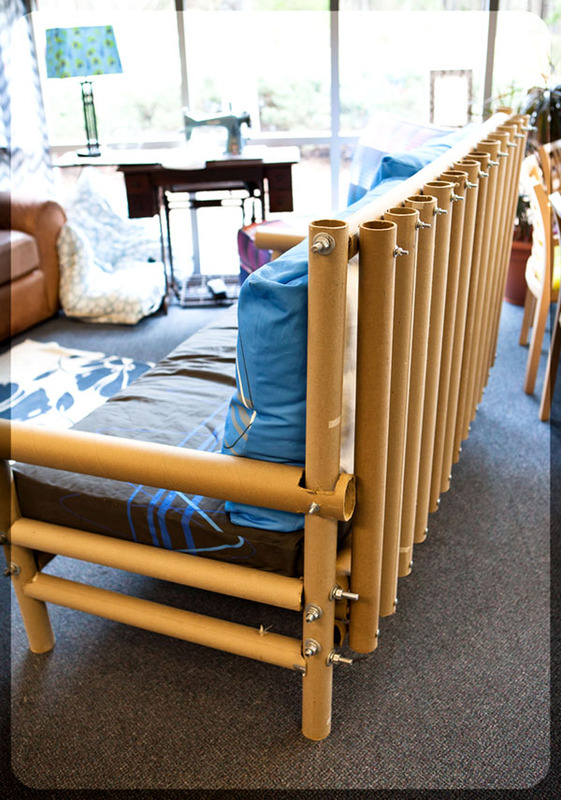 I realize that this item doesn’t feature fabric, but it DOES have to do with Spoonflower… they fashioned a sofa from the leftover tubes that their rolls of fabric come on. That is SO ingenious! I was quite fascinated with the actual printing room. 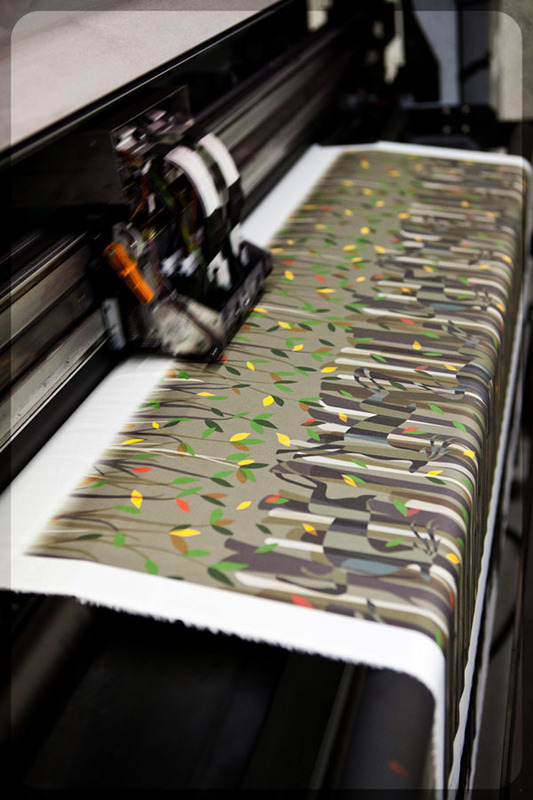 Mist was piped down over the machines as the print heads zipped back and forth printing fabric. In another area of the facility was the steam setting machines. 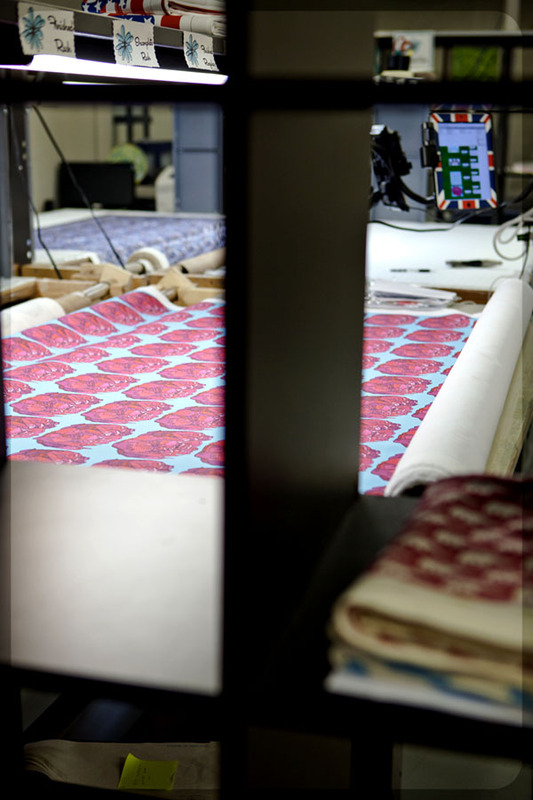 Fabric was slowly spooled through the machine as the fresh ink was set with steam. 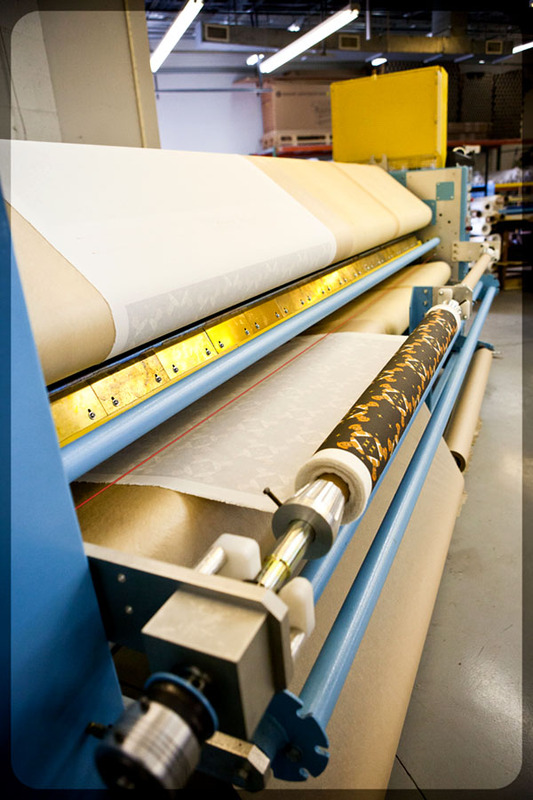 Once a roll of fabric was printed and set, it was then moved to the cutting tables. 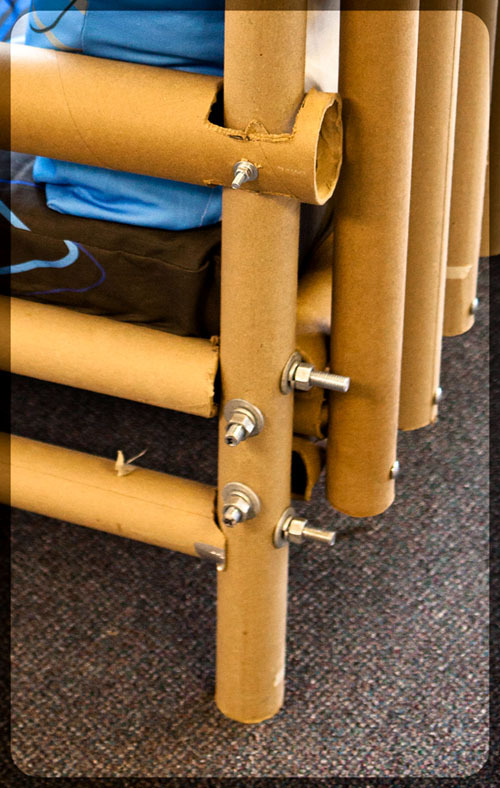 Each order was cut from the roll and folded and placed in cubbies. The fabric was then carefully packaged for shipping. There are several large shelving units of cubbies filled with hundreds of folded pieces of fabrics waiting to be sent out to designers from all over the world. I love this design printed on wallpaper on one of the walls. 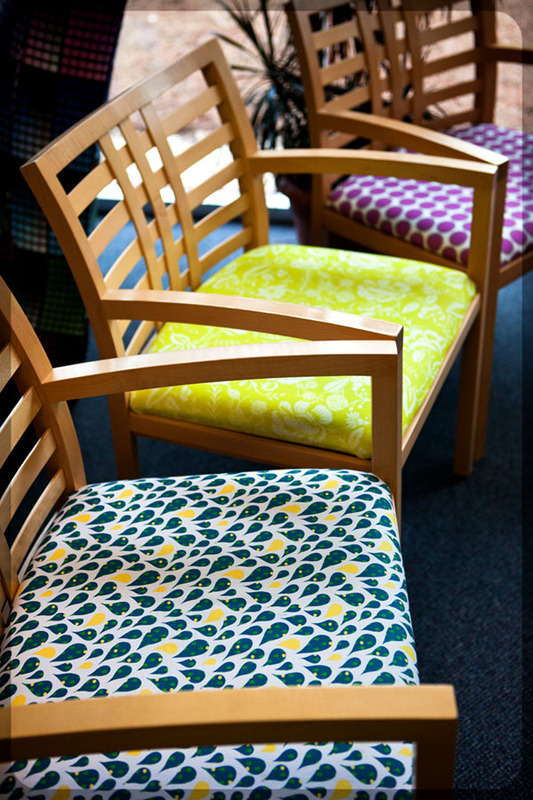 The tour was wonderful and inspiring and I went away with new ideas to use my own Spoonflower fabric designs. Best, I got to meet the great creators of the company and staff. As I was leaving, I noticed a pillow on a sofa in the guest area. It was made with Granny Square Fabric. I was thrilled to see the pillow because, unbeknownst to my tour guide, I was the original creator of the Granny Square fabric! 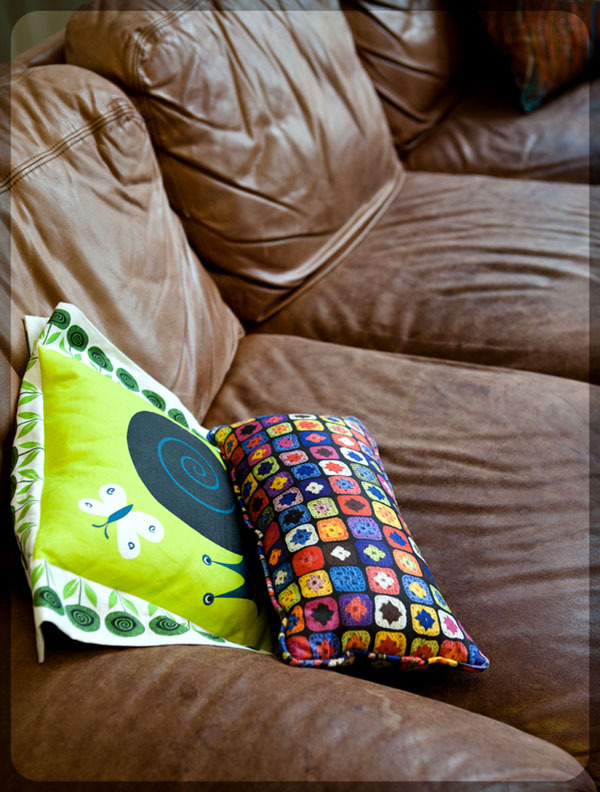 Someone from Spoonflower had purchased the yardage and made a pillow of it. What an honor to see the end result of my fabric. If you want a custom fabric that is truly original, consider having your own designs printed by Spoonflower. Most of the fabric I designed has deep personal meaning to me, such as Granny Square fabric, Julie 1971 fabric, Vintage Snowflake Wallpaper and more. Having your own designs printed on fabric is a terrific way to create a unique heirloom. And Thank You Spoonflower and Stephen! I loved the tour, you have a terrific company and I hope to stop in again this year. Such Pretty Things is one of my favorite websites because it has such pretty things! Jessica Enig truly does find the coolest stuff in luscious shades of aqua and pink. Jessica has a shop, Such Pretty Things filled with a splendid array of vintage and new craft supplies, home decor, party goods, cookie sprinkles and more. I just love the sugary goodness of it all. Not too long ago, I entered a drawing Jessica sponsored and won a box of such pretty things. What a surprise! The vintage millinery flowers are just gorgeous and the pale pink sequins, ribbons, flower brooch and sparkly butterfly inspire me to make something pretty. A beautiful package from Such Pretty Things arrived the other day. What a sweet note tucked into the package! A delightful assortment of vintage millinery flowers, velvet, satin and sheer ribbon, pale pink sequins and gems and a glittery butterfly from Such Pretty Things. A Big thank you to Jessica for sharing her love of pretty things through her blog.